Paul O’Byrne vividly remembers his asthma attacks as a young boy. Diagnosed with the chronic disease before there were steroid treatments or relief inhalers, he often struggled to get enough air. O’Byrne has dedicated his career to those living with asthma. He has spent close to 35 years as a clinician scientist, and has built an international reputation for translational research that has the health and quality of life of patients as the foundation. O’Byrne is a professor of medicine at McMaster University’s Michael G. DeGroote School of Medicine. He is also a researcher and past executive director of the Firestone Institute for Respiratory Health, a joint institute of McMaster and St. Joseph’s Healthcare Hamilton. As a respirologist, O’Byrne regularly sees patients at the Boris Clinic at the McMaster University Medical Centre. He considers his work as a clinician to be the single most important influencer of his research. Born in Dublin, Ireland, O’Byrne’s asthma diagnosis and physician’s recommendation to move to a warmer climate resulted in his family relocating to Africa when he was six years old. The family spent the next decade in Africa before returning to Ireland when O’Byrne was 16. It was there, during his last two years of high school, he decided to pursue higher education and study medicine. He completed a medical degree at University College in Dublin, then had the good fortune of completing a six-month internal medicine internship with a respirologist. O’Byrne came to McMaster for his residency in internal medicine and respiratory medicine in 1977. He undertook research training at McMaster and then at the Cardiovascular Research Institute in San Francisco, California. He returned to McMaster to join the Faculty of Health Sciences in 1984. O’Byrne’s name is now affiliated with research that has changed how the international medical community understands and treats asthma. He and late mentor Freddy Hargreave were part of ground-breaking studies at the Firestone Institute that fostered an understanding of the importance and effectiveness of inhaled steroids. He has made significant discoveries in the role of environmental allergens that drive asthma. And he has helped identify biologic drugs that can be used to help treat severe asthma. Most recently, his collaborative research which suggests the inclusion of a steroid in a rescue inhaler to reduce underlying inflammation in mild asthma patients is garnering international attention. Based on his extensive research program, O´Byrne is a prolific publisher. He has more than 450 peer-reviewed papers in highly-regarded journals, has edited 12 books, written more than 100 review papers, and he is a frequent lecturer at international meetings. 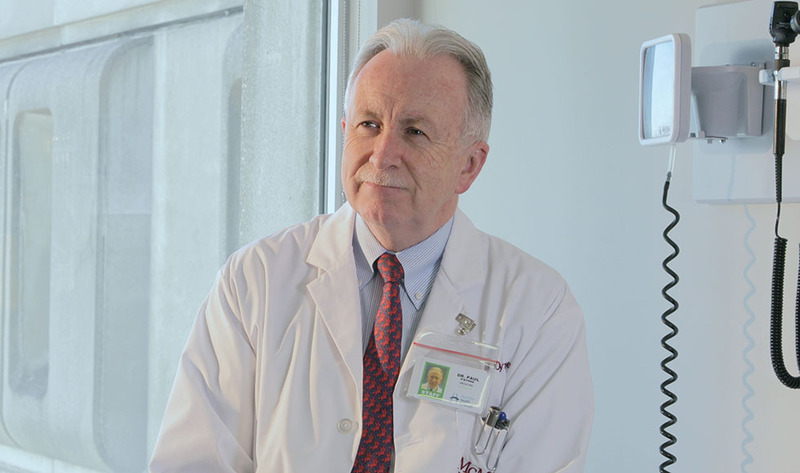 O’Byrne is a named Fellow at several international Colleges of Physicians. He was elected to the Royal Society of Canada in 2010 and the Canadian Academy of Health Sciences in 2015, and was named a Distinguished University Professor of McMaster that same year. “As a mentor, Dr. O’Byrne has inspired a great number of trainees to become independent and successful researchers. I was thrilled to return to McMaster to continue our work together,” says Gail Gauvreau, a professor of the Department of Medicine, co-director of the AllerGen NCE Clinical Investigator Collaboration, and a former graduate student of O’Byrne’s. O’Byrne has also taken on an array of leadership roles at McMaster University over the years, helping to advance the Michael G. DeGroote School of Medicine and Faculty of Health Sciences. He served as the chair of the Department of Medicine for 14 years from 2002 until 2016 when he was appointed dean and vice-president of the Faculty of Health Sciences. One of his goals in this critical leadership role is to nurture McMaster’s tradition of excellence in interdisciplinary research. O’Byrne says he is grateful for the ongoing support of his wife, Irene, and their three adult children Sarah, a lawyer at McMaster, Seamus, a clinical psychologist, and Paul Joseph, an accountant. He notes he is particularly fond of playing the role of the doting grandfather to his granddaughter, Alice, with another grandchild on the way.